Thank you John and Merry Christmas to you. Nice John ! thank you for sharing. 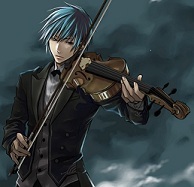 That Viola gets hard to put down,dosent it ? Nicely done! Merry Christmas Ferret. A very merry christmas, and a happy new year. I hope its a good one, with lots of good cheer! Good playing, Ferret. Nice sounding viola. Hope your holidays are happy ones. Thank you for the tune, Ferret. Love that dark viola sounding. Santa will there a bit late this year though. Didn't he ask post office service to deliver presents to you already? LOL, after so many years working hard in Christmas seasons, the man would need to kick back a bit, right? Merry Christmas to you and your family. Wishing you all the very best. John! Thank you.. That was lovely. Merry Christmas and Happy New Year! Thanks for the video, Ferret! Happy holidays!! !